Crush your goals with these 10 tips for running a successful marathon. My running days started on a hot sticky day in Federal Hill Park in Baltimore, Maryland in the summer of 2002. We were watching an outdoor theater production and a friend that was with us mentioned something about a running group he was starting. Running? Why would ANYONE do that for fun? Is that even fun? I was highly confused. But I went to the group the next Wednesday night, mainly because of the promise of burgers and beer after the run. But I fell in love with the sport and 1 month later ran my first 5K. And a month after that I ran my first half marathon. 3 months from zero running to a half marathon. You could say I was hooked. 16 years later, I’ve completed dozens of 5Ks, 10Ks and half marathons. And I’ve completed 3 full marathons. But there are some things that I wish I would have known from the start. Running is one of my passions and it has changed my life. I want to see you succeed too so I’ve put together my top 10 tips for running a successful marathon. Invest in good shoes. I cannot stress this enough. Regular tennis shoes just are not going to cut it. Get yourself to a store that specializes in running. The staff will take a look at how you walk/run and will recommend the best shoe for you. Good shoes are expensive but spend the money now on the shoes and not later at the doctor trying to fix something caused by wearing bad shoes. Invest in good socks. This goes hand in hand with the shoes. I used to get blisters constantly because I was wearing my everyday socks. I had no idea what was wrong. Then I tried some running socks called Balega and I haven’t had any blisters since. Balega socks are full of cushion and are the proper material to wick moisture away from your feet. You’ll have to figure out what type of socks work for you, but Balega are my favorite. Invest in good running clothes. Good running clothes are made of moisture wicking material and are way more comfy that cotton shorts and shirts. If I’m only going a short distance, I may wear a cotton shirt but on race day, I wear clothes made from wicking material. Carry water with you on your training runs. I never used to do this until I started training for the NYC Marathon. It doesn’t matter how long or short your runs are….hydration is key. Carry a plastic water bottle or purchase one that attaches to your hand. Eat properly. Many people think that if you are a runner, you can eat whatever you want because you will just burn it off. Yes, you will burn it off but eating poorly affects your body in other negative ways. My favorite pre-race food is a slice of wheat toast with peanut butter. Sometimes I will also eat a banana. Post-race, it is important to refuel your body and repair your muscles by eating protein. Chocolate milk has also been proven to aid in muscle recovery so you have my permission to indulge in that. That being said, I’m not a nutritionist and am not providing medical advice. Fuel yourself during the race. Have you ever heard the term “hitting the wall”? It’s when a runner’s body runs out of fuel and it makes it very difficult to keep going. It’s painful and mentally challenging to keep going if you hit this wall. In the marathon distance, it usually happens around mile 18-23 (for me anyway). To avoid this, be sure to take advantage of the food and drink that are at the aid stations along a race course. I like to alternate between Gatorade and water at the water stops. I also carry gels with me. Gels contain the carbohydrates and amino acids that your body needs to run long distances. I eat a few gels every 3-4 miles during a long race to keep my body fueled and running strong. Don’t worry if you can’t sleep before a big race. Everyone gets pre-race jitters and sometimes it affects your sleep the night before. I know that I am always nervous. It’s ok if you don’t get much sleep. I have found that all the adrenaline on race day makes up for it and can carry me through. When I was training for the NYC Marathon, I got less than 2 hours sleep before my 20 mile training run and I was perfectly fine. That being said, if you are experiencing regular insomnia, you should consult a doctor. Don’t try anything new on race day. Don’t eat something that you haven’t eaten before, don’t wear new clothes and do not wear brand new shoes. This is all a recipe for disaster. For everything on race day to go well, you need to have practiced everything beforehand. This includes practicing with your gels and water, wearing the clothes that you will wear on race day and breaking in your shoes well before the big race. You don’t want any surprises on race day so skip the coffee in the morning if you don’t usually drink it. Set realistic goals. It’s very tempting to set a huge goal but if it is too big of a goal, you run the risk of being very disappointed in yourself if you don’t achieve it. I desperately want to qualify to run the Boston Marathon. But as of now, I have to knock off over 45 minutes from my time to qualify. I have no doubt in my mind that I will qualify one day but it would be unrealistic for me to set a goal of qualifying in the next few months. Getting faster and stronger takes time and work and I have found that it is better to set goals that are just out of your comfort zone and not goals that are way above and beyond your level. Put in the work day after day, week after week, month after, year after year and you will one day reach that goal that you once thought was unachievable. 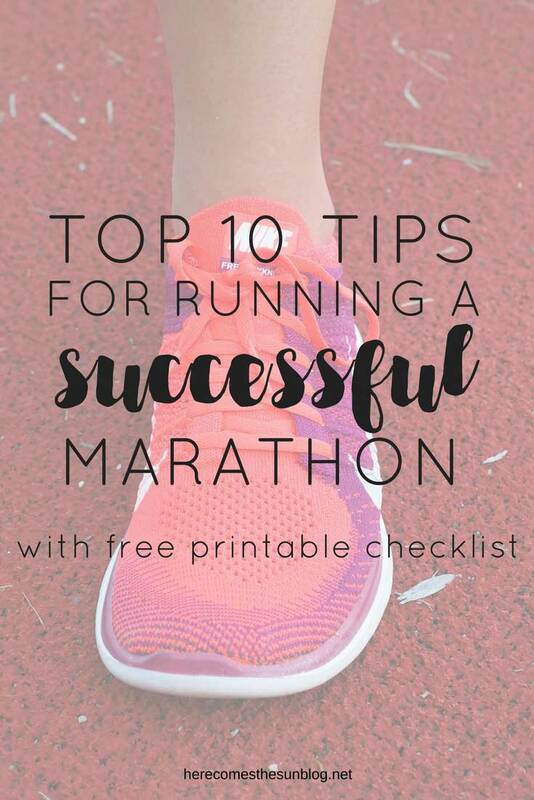 I hope these tips for running a successful marathon have helped you and I hope that you crush that goal that you have for your next race.